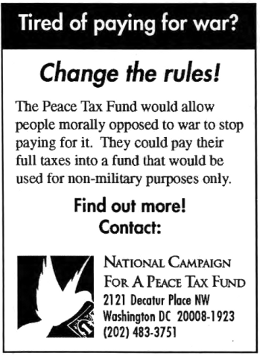 War tax resistance was largely found in infrequent mentions in the back pages of the Friends Journal in 1998 . After years as military tax refusers, during which we experienced the usual seizures of assets by the Internal Revenue Service, Edith Browne and I felt that the 1993 passage of the Restoration of Religious Freedom Act might provide us some relief. Past court decisions had made clear that exemptions from such taxes on the grounds of conscientious objection to participation in war or in preparation for war would be denied. The new act, however, suggested that we might be exempted from the interest and penalties routinely added to whatever the IRS claimed we owed. We filed for refunds, therefore, for the interest and penalties for the years 1993–95 , and, when the refunds were denied, brought suit in Federal District Court in Vermont for their recovery. Though we had filed our case independently of any others, we soon learned that Priscilla Adams in Pennsylvania and Rosa Packard in New York, both, like us, Quakers, had filed similar suits in their areas. In responding to the three suits, the attorneys for the IRS linked them, responding, for example, to our suit by alleging to the court that we had followed a practice in our tax refusal which was Rosa Packard’s method, not ours. The government moved for dismissal without a hearing, and our case was dismissed, as Priscilla Adams’ case had been earlier in Tax Court and as Rosa Packard’s was subsequently in District Court. Feeling that we had not been heard, we have filed an appeal. A relative novice in legal proceedings, I was struck by the fact that the legitimate requirement of objectivity in dealing with legal matters risks the depersonalization of the search for justice, which is, after all, about human beings, both as individuals and in community. With our case decided in Vermont (the Appeals Court is in New York), I felt a strong need to write to our Vermont judge as a person. I did so but have received no response. For those who might be interested, I offer below what my letter said. I omit the judge’s name and address, lest some generous Friends be tempted to write to him on our behalf. I did not write with the purpose of applying political pressure but to try to establish a personal link. Edith Browne and I are not familiar with legal practices, our present case asking the refund of penalties and interest charged by the Internal Revenue Service being the first case we have ever been involved in. It is my understanding, however, that having accepted the government’s motion to dismiss our petition, you are no longer involved in the case, and it will not be improper for me to write to you about it. Naturally, we were disappointed with your decision and are appealing it to another court, in part because we felt the decision distorted what we have done and said and partly because we feel certain that it was the intention of the authors of the First Amendment to the Constitution and of the recent Restoration of Religious Freedom Act to make room in our national community for views such as ours. That certainty is a source of great pride to us. We know that there are many places in the world where a claim such as ours not only would have no status but might place the claimants themselves in danger. We have been in such places for varying lengths of time: in Greece under the fascist colonels; in Turkey when it was under martial law because of terrorist bombings; in Colombia when it was under martial law because of assassinations of members of the judiciary; in South Africa under apartheid, where even to visit our coreligionists in Soweto without government permission made us and our friends liable to arrest. We are grateful for the individual freedoms we citizens of the United States enjoy. To us, one of the most important of these is freedom of conscience, provided for in the “exercise” section of the First Amendment. The founders of our nation knew about its need from painful experience in the religious wars and persecutions that were so often a curse in Europe. Further, they had seen the effort to import such ills to the New World. Four members of our own religious denomination, Quakers, were hanged on Boston Common and 14 more were waiting in prison for such treatment when Charles Ⅱ ordered the Puritan authorities to end such executions. That did not prevent, however, their continuing to exile Quakers and others who held differing religious views from theirs or, in the case of many Quakers, to whip them out of the colony at the tail of a cart, or to bore hot irons through the tongues of those who had tried to preach in public, or to cut off their ears. All of those things were done to Quakers in the Massachusetts Bay Colony. That history is not pretty, but it made our forebears sensitive to the rights of conscience. In your opinion, you suggested, as Patrick Leahy has in correspondence with me when I have sought his help in providing legislative relief, that consideration of matters of conscience in regard to taxes would result in chaos. We are not aware of chaos resulting from the legislative provisions for conscientious objectors to conscription of their bodies. Wise legislators seemed to us to provide for conscientious objectors to conscription of their resources through the Restoration of Religious Freedom Act. And if it is chaos we fear, what chaos is worse than that resulting from war? I did not write this letter intending to argue our case, though I guess, perhaps, I have. I really do mean to leave that to the lawyers. Rather, I wrote to ask who will defend liberty of conscience if individuals like us and the courts do not. There are always those among us who would impose their religious views on everyone else if they could, just as there are those who would insist that religion provides no legitimate exceptions in consideration of public policy. It has been the genius of our system to try to provide a balance between those extremes that infringes on the freedoms of no one. I enclose two [several] pages from the Book of Faith and Practice of New England Yearly Meeting of Friends . It is the volume that describes the experience of Friends and the practices arising from those experiences to which most Friends subscribe. I hope you will find them interesting and informative. I particularly call your attention to the story of William Rotch of Nantucket. Like him, if we are in error, we are to be pitied, but, also, like him, we can do no other than we are. That issue also noted that the National Campaign for a Peace Tax Fund was still doggedly gnawing away at the federal bureaucracy, this time meeting “with tax policy officials at the Department of the Treasury” to try to persuade them that the law would be in their interests and that they should override IRS objections to the bill.